The tools panel in Blend includes a button that lets you insert layout panels into your user interface. 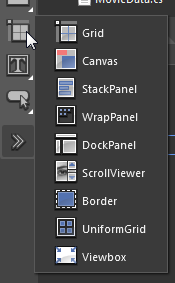 By default, the icon on the tools panel will allow you to insert a Grid into your user interface. If you right-click on this icon, or left-click and hold, you’ll see the full list of available layout panels. You can then left-click to select the one that you want to insert. With the desired panel selected, you can double-click the icon to insert the panel. The panel will be created as a child of the currently selected layout container or as a child of the layout container where the cursor is currently located in the XAML editor. In the example below, we add a StackPanel as a child of the main Grid by selecting the StackPanel icon on the tools panel and then double-clicking it.